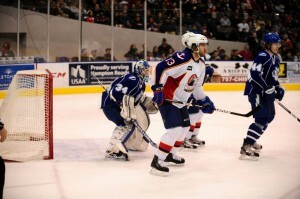 The Syracuse Crunch stonewalled the Norfolk Admirals Friday at Scope skating away with a 3-0 victory. Tonight’s match was a highly penalized tilt. Referee Terry Koharski handed out 128 minutes in penalties with many being fighting majors and misconducts. Folks, this tilt was not for the faint of heart! Norfolk center Chris Wagner squared off against Syracuse’s Cory Conacher just minutes into the opening frame. Wagner chirped about his first scrum saying, “He had me in a headlock at first and I asked him what’s going on? He didn’t say anything and it kind of happened.” Koharski deemed it was not a fight and gave both combatants double minors for roughing. Syracuse opened up scoring seconds after the Wagner and Conacher dust-up on the powerplay. Second year pro Richard Panik tallied his 6th goal of the season on a shot that eluded Admirals goaltender Frederik Andersen. Syracuse’s Tyler Johnson contributed offensively scoring his 20th goal of the campaign slapping a shot that tickled the twine to pull the visitors ahead by two. The visiting club had the upper hand in shots the 1st period outshooting the home team 10 to 6. Neither team found the back of the net during the middle frame; however; there was four ten-minute misconduct penalties resulting from fights. Once again Syracuse outshot their opponents 8 to 5. Keith Aulie sealed the shutout win for Syracuse one-timing a shot past Andersen at the 17:04 mark of the 3rd period. The final shot count was in Syracuse’s favor outshooting Norfolk 29 to 22. Netminder Dustin Toakarski was credited with the win for the Crunch. Syracuse was successful on 1 out of 3 power play chances. Norfolk was 0 for 6 with the extra attacker. The Admirals now look for greener pastures today at Scope when they rematch the Crunch at 7:15 in downtown Norfolk.